Vote to Protect Our Planet! Our 8-year-old twins marched together with thousands of environmental activists in Tel Aviv, March 29th 2019, to demand action on climate change. Our daughter composed the slogan and we all colored the poster together. In the run-up to the elections here on April 9th, the burning issue in Israel — will Benjamin Netanyahu be re-elected yet again as prime minister, despite facing indictment on corruption charges? — has all but effaced the burning issue facing the planet: climate change. The scientific evidence is clear and irrefutable: human activity, including burning of fossil fuels, is causing our planet to heat up at a perilously high rate. According to the October 2018 report by the Intergovernmental Panel on Climate Change, we have just 12 years left to limit global temperature rise to a maximum of 1.5° celsius. Limiting global warming to 1.5° celsius would require “rapid and far-reaching” transitions in land, energy, industry, buildings, transport, and cities, the panel of climate scientists said. To meet this target, the IPCC report recommends the use of renewables meeting the majority of future electricity supplies, phasing out unabated coal use by mid-century, and a 35 percent reduction in methane emissions below 2010 levels by 2050. Even half a degree higher than the projected 1.5 ° celsius will significantly worsen the risks of drought, floods, extreme heat and poverty for hundreds of millions of people worldwide. What can we do to act on climate change? 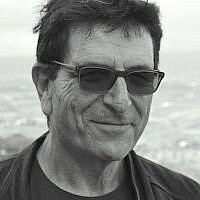 We can make a strong effort to reduce our own emissions, by, for example, walking more and driving less, flying less, eating less meat or no meat at all (the global livestock industry produces more greenhouse gas emissions than all cars, planes, trains and ships combined) and using solar energy–of which, in Israel, there is an abundance. We can also get informed and get involved. 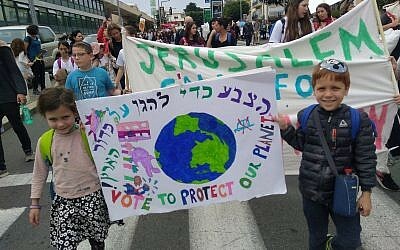 Last Friday, March 29, my brother Jeffrey, my eight-year-old twins and I joined thousands of marchers who turned out in Tel Aviv to demand action to combat climate change. The parties, their positions on the environment “and their willingness, or not, to take concrete action to combat global warming,” are listed below. Their recent manifesto includes a section on environmental issues. This party, to its credit, has developed a program to remove some of the polluting industries from Haifa. This has not yet, however, been adopted as government policy. Kulanu has come out in favor of speeding up the transfer of the economy to renewable energy. However, they have not provided any specific figures in that regard. This political alliance has an environmental section in their manifesto which covers, at least in summary, a range of issues, for example the need to transfer the economy to renewable energy. They are not very persuasive, seeing that they do not specify a target for 2030. As the next government should be able to influence the target for 2030, this omission is sorely lacking. On the positive side, this party includes Israel’s most prominent environmental activist, Miki Haimovich, close to the top of its list. The basic focus of this party is on social issues. Their manifesto does have some environmental touches, including a specification that new buildings should be built to be energy-saving. A manifesto for the combined list could not be found; however the Democratic Front for Peace and Equality (Hadash) does have an environmental section in its manifesto which touches on a good number of issues. It should be noted that in the current Knesset this party includes MK Dov Khenin, who was active on environmental issues. However, he is not standing in the current election. This party includes in its ranks Yael Cohen Paran, who has been devoted to environmental issues for a long time both before and after becoming a member of the Knesset. Likud, which has been the main governing party in Israel since 2009, has not put out a manifesto for the last elections. The party says that they should be judged on their actions over the last decade. With regard to environment and climate change, Likud has set a target for electricity generation of 17 percent renewable energy by 2030. However this is far too low to combat climate change. Likud has also not implemented previous government decisions to reduce energy consumption by 17 percent. 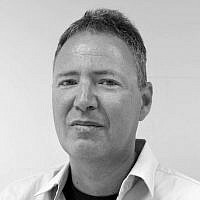 There is no indication that there will be any change if the Likud forms the next government. Meretz has a long and detailed section in their manifesto which is devoted to environmental issues and it is thoughtful and well-written. With respect to climate change and the need to transfer the economy to renewable energy, their position, while better than most, is not the best. They discuss transferring the economy to renewable energy, such that by the year 2030, thirty percent will be generated by renewable energy. This is less than the recommended amount by the International Panel on Climate Change. Nevertheless, all in all, they have a fairly strong environmental manifesto. Note: We have recently received a response from Tamar Zandberg, the head of the party, who says that Meretz will support reductions in emissions of greenhouse gas emissions in line with the recommendations of the International Panel on Climate change. This party originally published a manifesto with no reference to environmental issues, let alone climate change. They have recently tacked on a chapter at the end which does at least, in summary, promise to deal with environmental issues. Nevertheless the general tone of their manifesto is in favour of deregulation. The New Right is a party which seems to be heavily influenced by the American Republican Party – in other words, not prioritising the environment. This party’s manifesto runs to just five pages. They do not include any reference to environmental issues. I could not find a manifesto for the combined list; however the Balad party has published a manifesto with a few generic sentences in favour of the environment. There is no combined manifesto. As far as we have been able to ascertain, HaBayit Yehudi (Jewish Home) has not issued a manifesto. We have also not found a manifesto for the Ichud Leumi Party. 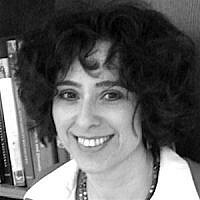 Otzma Yehudit (Jewish Strength) has a summary of its positions on its web site with no mention of environmental issues. Searching for this party’s manifesto leads to the Facebook page of Shas leader Aryeh Deri. In any case we did not find any stance relating to the environment. As far as we have been able to determine they have not produced a manifesto for this election. They have a section in their manifesto dedicated to environmental issues. This does include a statement that it is the responsibility of the government to ensure the wellbeing of the environment. On the other hand, most of their policies are not at all environmentally-friendly. The manifesto shows influence of the American right wing and quotes approvingly Republican politicians to the effect that public transport, railways, etcetera, should not be subsidized. They are of the opinion that private cars are not the source of pollution in cities. There is no mention of climate in their manifesto and no proposed steps to combat it. In addition, their proposal to abolish the Ministry of the Environment and transfer its powers to a Ministry of National Resources is in practice likely to lead to a weakening of environmental standards. On the subject of Judea and Samaria (the West Bank), they do include a long list of environmental problems. However, their proposed solution – that Israel annex all of those territories – is not realistic, as pretty much nobody else supports it. As their solution to the environmental problems of Judea and Samaria/the West Bank is unlikely to materialize, they are left with no practical solution to these environmental issues. In short, the Zehut party is not an option for anyone who values the environment. First place: the Israeli Labour Party. It is the only party proposing to reduce Israel’s greenhouse gas emissions in line with the recommendations of the International Panel on Climate Change. Second place: Kahol Lavan. The alliance has a strong environmental candidate in a prominent role. Third place: Meretz, a party with a strong environmental platform. Fourth Place: Kulanu, on the basis of their platform. which does promise to speed up the transition to renewable energy. Fifth Place: Gesher for including some environmental issues in their manifesto. This report was compiled by Yakov (Jeffrey) Glausiusz, with the support of Adi Romi, Liel Biran, and Daphnee Azoulay.